IKEA furniture is well known for its modern, innovative design. Is that true of their advertising as well? The company sells low-price products, including furniture, accessories, and fabrics for every room of the house at retail stores around the world. 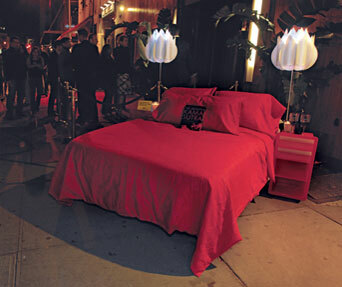 The furniture, fabrics and overall design are all very innovative, lets see how their advertising stacks up. 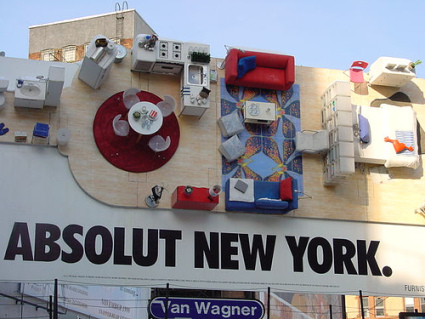 A play on the infamous Absolut ad campaign, IKEA actually placed furniture and created a 3D billboard mocking the set up of a New York apartment on this billboard in Soho. 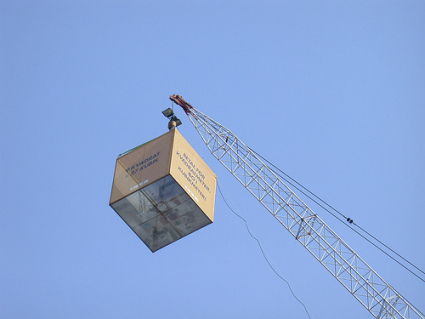 In order to advertise a line of bedroom furniture, this "room in a cube" was seen actually suspended from working construction equipment. There was actually a full room set up in the cube and IKEA used the exterior of the suspended cube for their advertising message. 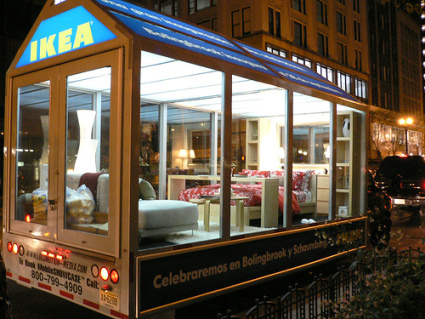 This cart on wheels served as a mobile showroom, full of IKEA furniture, with transparent windows and literally strolled through the streets of Chicago. 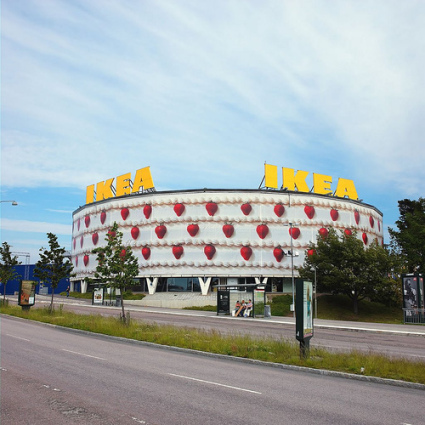 To celebrate its' 40th anniversary, the IKEA in Stockholm decorated its' store like a birthday cake. 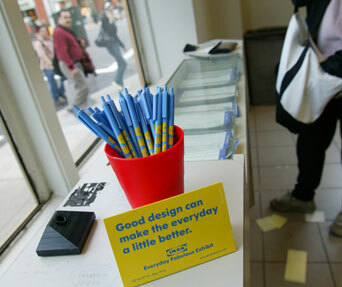 IKEAs are still few and far between in the US but are very popular in Europe as the brand has been around since 1943. 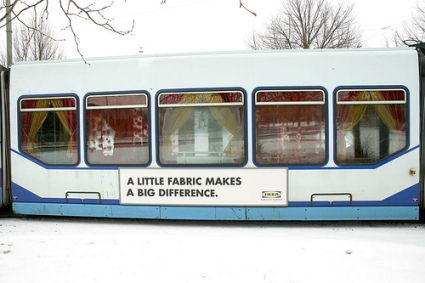 Instead of creating a whole anniversary campaign, IKEA used what they already had, their store, to promote the celebration. 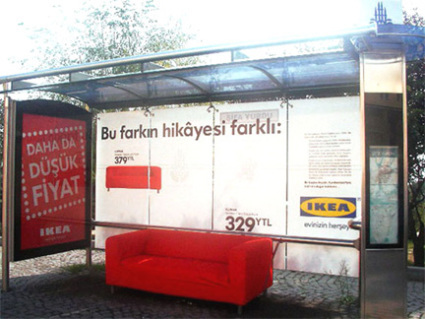 At this bus stop, an IKEA sofa was available for people to sit in as they wait for the bus, as opposed to the regular metal bench, and there’s a background advertisement with detailed information about the sofa and its price. 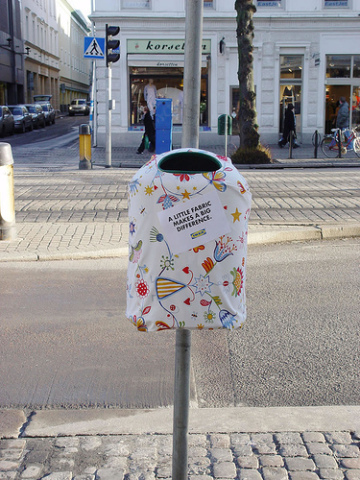 This campaign covered the streets with fabric. 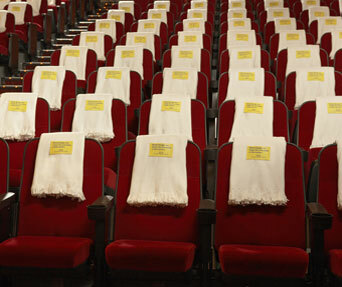 As you will see they literally took everyday objects and covered them with fabric to advertise the company. To celebrate the grand opening of the new IKEA store in Japan, the company set up 14 outdoor street displays to show off the offerings of the new store. 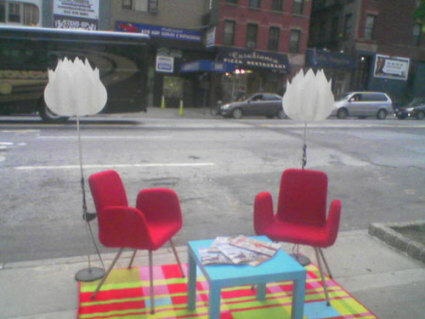 They were simply placed on street corners, in front of building and near public transportation. 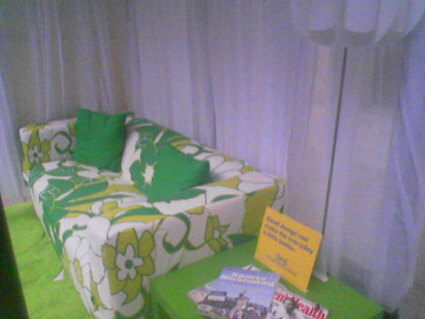 Actual furniture, accessories and fabrics were used. By far, my personal favorite. 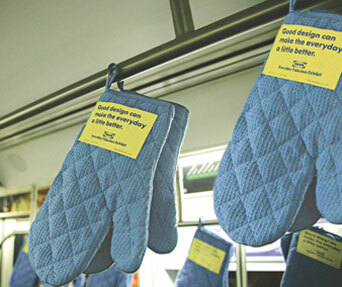 This campaign literally took over the streets of Manhattan during Design Week last year. 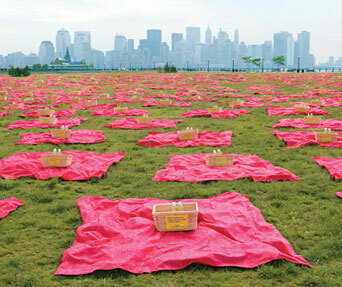 IKEA did makeovers in Manhattan – 670 of them to be exact. 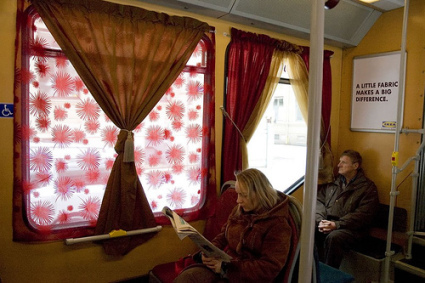 Empty bus stops were turned into living rooms with couches, and oven mitts hung from the ceilings of subways, so passengers could avoid touching the dirty metal and pillows were placed on park benches. 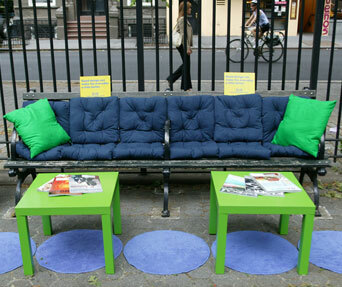 The message was clear: IKEA is affordable and functional, and the others simply are not . 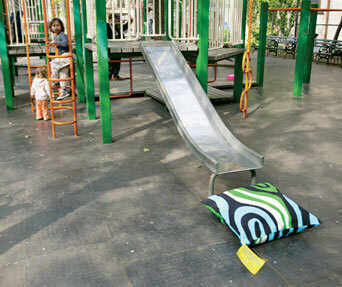 In local parks, with all of the picnic baskets reading "Good design can make the everyday a little better." And finally in movie theaters. 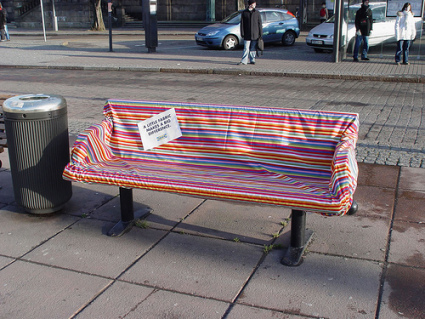 What do you think of this innovative company's creative advertising? 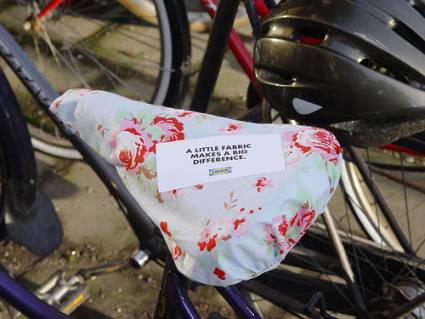 Does it statck up to their innovative merchadise?